In this relaunch of the IDW series, our famous foursome of Ghostbusters have been spirited away to a parallel dimension, leaving NYC at the mercy of spooks, specters, and everything else that goes bump in the night. Who will save our city? Are the original ‘busters gone for good? The answers to these questions and more await, right after the jump! Previously in GHOSTBUSTERS: In the first volume of Ghostbusters by IDW, the team faced off against a new minion of Gozer, battled a possessed amusement park, took a cross-country trip to battle spirits from coast-to-coast, took on Death himself and probably saved the world at least three times. More importantly, the universe of IDW’s Ghostbusters was introduced and explored, creating an expanded cast of heroes, villains, friends, and enemies. I think the first question on everyone’s mind when reading solicits about this issue is, “Have they really gone and replaced the Ghostbusters with a new team?” Well, the answer is, of course, a little muddled. This introductory issue begins with Peter, Egon, Ray, and Winston up to what they do best…living the lives of spookhunting celebrities. But in an instant, the guys get pinched by some otherworldly villains (with a passing resemblance to the RGB’s “Peoplebusters”…which even gets a quick nod in the story!) and NYC is left with no defense to the supernatural. This is where the new team begins to come together. Much of the issue is spent in exposition, as Walter Peck plays a major hand in creating and controlling a new team of paranormal eliminators. The new team is made up of regulars from volume one of the new series, but each person is given enough play here that new readers will know who they are. A rebranding of the Ghostbusters series is a pretty gutsy movie. From a story standpoint, the new team is going to be interesting. But besides Janine Melnitz, the new members aren’t going to have much resonance with new readers. Don’t get me wrong, they have all been great in the series before (especially perennial jerkwad Ron Alexander) but new readers won’t have the attachment they do to Venkman or Zeddemore. That said, it’s good to know that this new team is not designed to stick around forever. Rather, what we have here is another effort to expand the Ghostbusters universe and keep the stories fresh and exciting. The original squad of GB’s will continue to be in each monthly book while the replacements keep the proton packs warm for their return. For fans of Ghostbusting in any incarnation, this book is a must-read. For those on the fence, definitely give it a try. It’s a fun book that maintains the original sense of humor that made the movies the classics they are today. The new team is made up characters that are uniquely different from the original. This book has a freshness to it, and as the series continues I will be watching to see where the story will lead. The New Ghostbusters #1 gets four stars out of five. 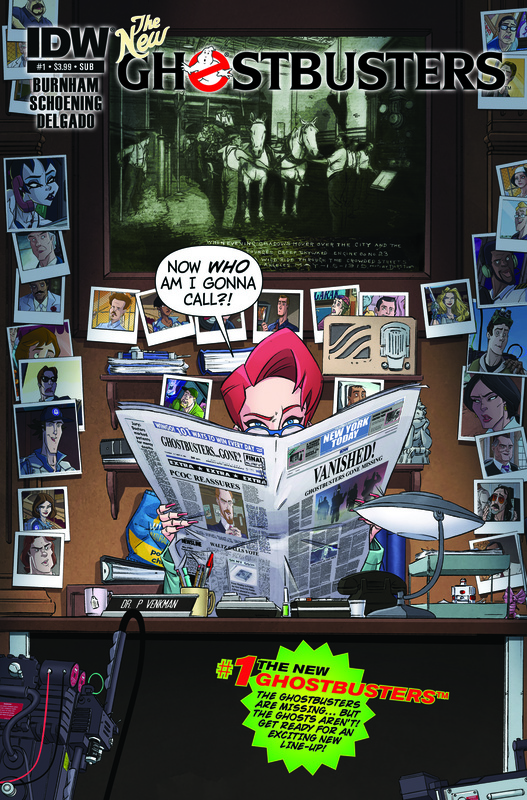 Previous ArticleSOLICITATIONS: Titan Comics launches It Came! According to an interview with Burnham, the new team will be around for a few months and then the original team will be brought back. Depending on sales, they may keep both books going or they may ditch the new team. I always think back to Peter’s line in the first movie about franchise rights and am surprised there isn’t at least a few established branches elsewhere building their own stories. Actually, there is a secondary GB franchise based in Chicago during this series. It is operated by “The Rookie” who starred in the GB video game. That’s right!! I completely forgot about that one… Although they haven’t really done much with the characters in the comic, have they? I know that the cartoon male/female rookies and the “realistic” male were named in one of the books, but I don’t think they’ve really taken advantage of the concept, have they? Not bad. One franchise is better than none, at least, though I can see a lot of story potential in there being more. Although I will admit, I do like the idea that the franchise is in Chicago. It lets me imagine the comic world version of me has probably applied (and probably denied and ordered to keep at least 100 feet from the property at all times).